Mignon Fogarty, a.k.a. Grammar Girl, is determined to wipe out bad grammar—but she's also determined to make the process as painless as possible. One year ago, she created a weekly podcast to tackle some of the most common mistakes people make while communicating. More than seven million episodes have now been downloaded, and Mignon has dispensed grammar tips on Oprah and appeared on the pages of the New York Times, the Wall Street Journal, and USA Today. podcasts are known for, Grammar Girl's Quick and Dirty Tips for Better Writing covers the grammar rules and word choice guidelines that can confound even the best writers. From "between vs. among" and "although vs. while" to comma splices and misplaced modifiers, Mignon offers memory tricks and clear explanations that will help readers recall and apply those troublesome grammar rules. 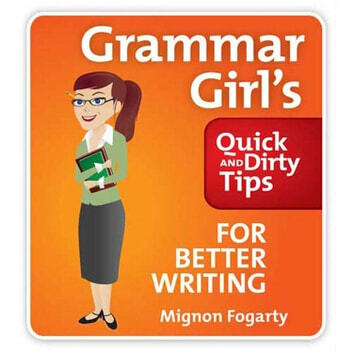 Chock full of tips on style, business writing, and effective e-mailing, Grammar Girl's latest audiobook should be heard by every communicator.